Here is a fantastic Pat Broderick pin-up that appeared in The Fury of Firestorm The Nuclear Man #12 (cover dated May 1983). 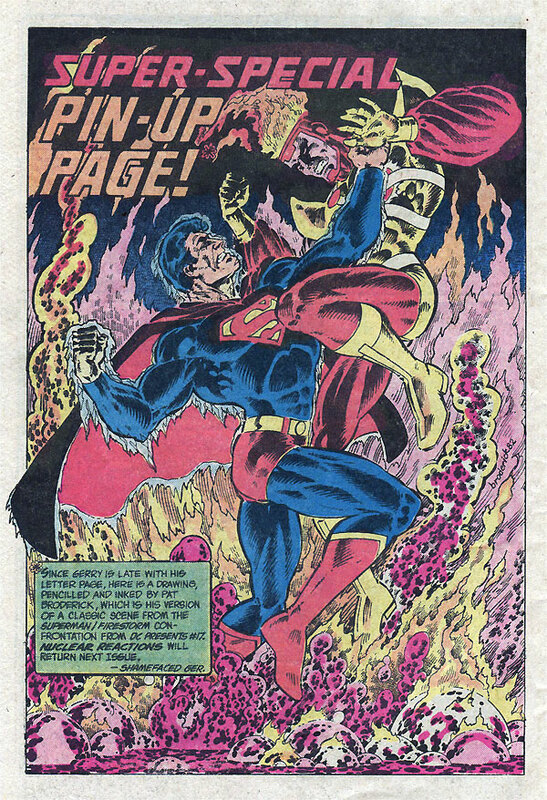 The drawing reenacts a scene from DC Comics Presents #17 in which Superman (under Killer Frost’s control) attacks Firestorm. Pat Broderick is such a great artist and did amazing things while on the Firestorm book. Writer Gerry Conway used to answer The Fury of Firestorm The Nuclear Man letter column entitled “Nuclear Reactions”. Apparently, this particular month he was running behind. Doubling also as the editor, Conway had to decide to run this pin-up in place of a letter column. Let’s all be glad he did. What a cool pin-up! I was re-reading this comic recently and stumbled across the pin-up. It was an unexpected, yet pleasant surprise. I always remember a cover, but often forget about cool pin-ups like this. Enjoy! Posted in: Comic books, Firestorm #01: Original (Ronnie/Martin), Firestorm comic vol. II, Gerry Conway, Killer Frost, Pat Broderick, Sketch/Art. ← Firestorm’s fate after ‘Blackest Night’ revealed in ‘Batman: Brave & the Bold’ cartoon? I remember really digging this illustration back in ’83. The only thing about it I didn’t like back then was the yellow top of Superman’s right boot. (I’m sure it was just a colorist error). After seeing it, I wanted to see Pat illustrate a Superman story.